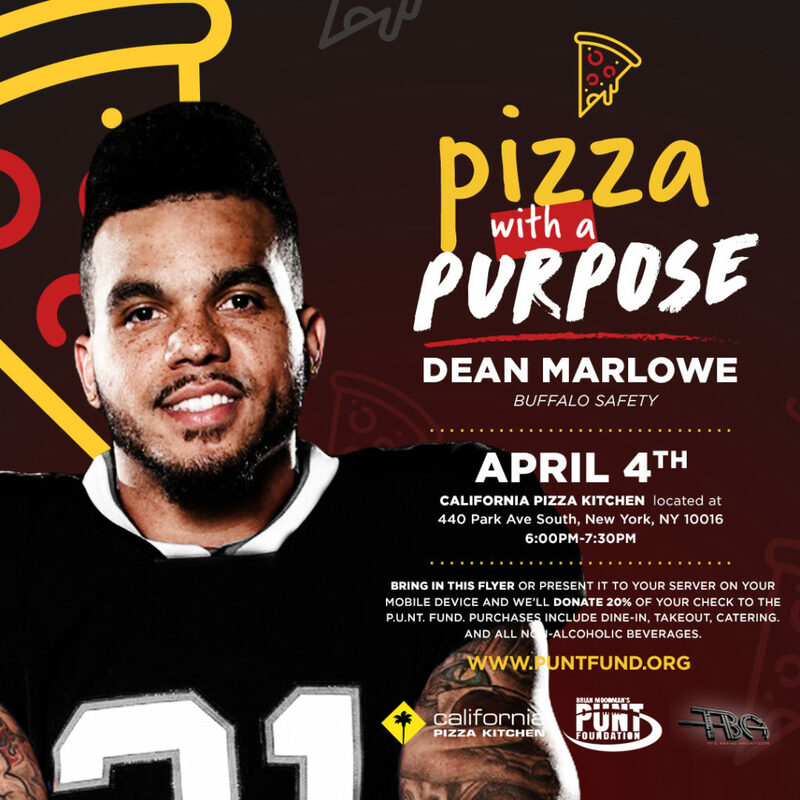 Queens born and raised Buffalo Bills safety Dean Marlowe will be here in his hometown this week raising money for the PUNT Fund. Dean, who played as a rookie in Super Bowl 50 for the Carolina Panthers, has remained in Buffalo all offseason and has become very active with PUNT, making visits to kids battling cancer and is even at a retreat for bereaved families this weekend. As father to a 6 year old Bills fan who lost her life last year after battling the effects of cancer treatment, I can personally attest to the fact that PUNT does wonderful and important work for Western NY families who are battling or have battled childhood cancer. Please consider joining us this Thursday, April 4th from 6-7:30pm at California Pizza Kitchen on 30th Street and Park Avenue. Meet Dean and 20% of your check will go to helping childhood cancer families. Hello all 2,200 NYC Bills Fans! Finally, Squish the Fish time is finally upon us, it’s been just too long as we finally return to the location of the playoff drought’s end. As always this time of year, we know you need an excuse to head into the city to check out the holiday stuff, so lumping it in with a Bills game on 42nd and 2nd on Sundays is always a great excuse to do it. The 2-wins-in-a-row Buffalo Bills take on the Phins this Sunday at 1pm. You know the place and specials, we’ll see you there. As a side note, we became friends with former Buffalo Bills long snapper Garrison Sanborn and his wife Tara, who played for our teams for years. He’s now with the Bucs, and chose to honor my daughter Sally who passed away in September with his My Cause My Cleats. He and his wife Tara designed cleats for Sally that he will wear during this Sunday’s game against the Panthers, which I’ll have to figure out a way to switch back and forth to. My TV/Internet went down just before the game last week and wasn’t able to get to a bar, so was only able to follow along on Twitter. I guess it was a blessing in disguise. There was actually a good article in the BN that laid out the case that Peterman had a decent game despite everything and did what was asked of him. He certainly can’t win games on his own, so others need to step up and aren’t doing it. Hopefully Allen can return this weekend and provide a much-needed spark to the team. You can catch the Bills/Jets game at McFadden’s & Calico’s as always starting at 1pm. For those going to the game, you can check out the tailgating info here, including change in location (https://nycbbb.com/notes/bills-jets-tailgate-info-2/). One thing I want to call out is for us Bills fans to be respectful. Please clean up after yourselves as you head into the stadium. Last year it was a disaster and also had some idiot jump through a table and crack open his head. We’ve been doing this tailgate for years, let’s not ruin it for future games in NJ. Also, both teams are rebuilding and neither team’s fans are in a place to talk down the other team. Unless you’re calling out that the Jets play in NJ. That’s OK.
Also, this Sunday is Kenny Johnson’s 400th straight game (both home & away)! Most will know him from the Pinto tailgate he does in Orchard Park, he’s an awesome guy who deserves to be celebrated. In fact, we’ll be celebrating him this Saturday night at McFadden’s. From 7-10pm there will be a bracelet special that gets you $5 drafts and well drinks. Kenny and many of the other Super Fans will be there to raise one (hundred) drinks to Kenny’s milestone, hopefully you can join them. I know there’s some things planned for Sunday at the tailgate as well. The Bills host the Pats tomorrow night in Buffalo. This has been a very up and down season, hopefully the defense can return to form in front of a home crowd, it’s a bummer that Josh Allen is still out. I watched a great documentary on Brett Favre the other night and his start reminds me of Allen’s, the Bills really need to know by season’s end if he’s going to be the man going forward so hopefully will be back in the lineup soon (here in NJ?). In the meantime if the Bills D can rebound we stand a good chance for an upset as the Pats are likely already looking ahead. Being a rare Monday night game, we’re going to change things up a bit as, well, it’s a Monday night. There will be no wristbands sold, instead McFadden’s and Calico’s will offer $5 drafts and mixed drinks as well as 50 cent wings from the start to the end of the game. C’mon down to 42nd and 2nd and catch the game with all your fellow Bills fans. As somebody from the Bills org mentioned to me after the game last week – “The defense is starting to look like what we thought it’d be this season, the offense is starting to come around as we hoped”. I’d say that’s a good summary of where we’re at. The defense is starting to gel and show promises of what their potential could be. I liked that they reigned in Josh Allen last week and fed the McCoy meter, give the rock to your best player and let Allen learn he doesn’t need to carry the team on every play like he did in college. Hopefully during the season a balance between those will be struck. The Bills head down to Houston this weekend to take on the Texans. It’s finally turned to fall here in NYC, so those who have been spending their Sundays squeezing in those last sips of mimosas on 80 degree Sunday afternoons the last few weeks…it’s time to come home and join your NYC Bills Backers as we’re 2-3 and in the thick of things. Join us at McFadden’s and Calico Jack’s this Sunday at 1pm, my son William and I are planning on being there. I wanted to thank all of you who have reached out to me and my family about the loss of our 6 year old daughter Sally. She was an inspiration to us all. I wore a Bills shirt when she was born, and wore one as she passed away in our arms. She didn’t know what a baseball or hockey puck was, but she knew what a football was and loved to play catch with one. She loved the Buffalo Bills, she would always choose a Bills shirt over any other option we presented, and would yell “Go Buffalo” whenever she saw football on TV. She was a beautiful child, both inside and out, and Daddy, Mommy, Thomas and William miss her so much. We also know she’s in a better place. William felt strongly we’d win last week because Sally would bring us luck, and sure enough, she did. Thank you Sally. There will be an article on Sally in this Sunday’s Buffalo News, we gave an emotional interview at the game last week where we were guests of the team and the PUNT fund, so be on the lookout. Chargers @ Bills, Josh Allen! As I mentioned last week, anybody who thought we were going to be a solid playoff caliber team is kidding themselves. The franchise had itself a badly needed enema a year ago, and I personally think the McBeane duo has a total of 4 seasons to get this right (including last season). It’s going to take time to build a perennial playoff caliber team through several drafts and some key free agents. It’s going to be a wild ride getting there, and us fans need to be a bit patient (and yes I know we’ve been patient for a long time). I don’t fault McDermott’s decision to start Peterman either, it took a bit of pressure off our new starting QB, Josh Allen (and gave him a touch of an ego check). Be patient Bills fans, Allen is going to have a lot of ups and downs this season, just enjoy the ride. C’mon down to 42nd and 2nd tomorrow to catch the start of that ride along with your fellow NYC Bills Backers as they take on the San D….Los Angeles Chargers at 1pm. Lots of fans always head up to the motherland for the home opener, so you have a slightly better chance at getting a good spot in the bars. I’m sure everybody wants to watch Allen’s first game with some other Mafia. We always welcome feedback on how things are watching the games at the bar, so please hit us up. Also, if you aren’t already doing so please follow us on Twitter and Facebook. Hello all 2,000+ NYC Bills/Sabres Fans! Happy Dahlin Day! Tonight is the NHL Draft and the Sabres will officially select generational talent Rasmus Dahlin with the first overall pick. There’s also rumors the Sabres could trade up in the top of the draft, even as high as #3 overall. Hello all 2,000+ NYC Bills (and Sabres) fans! With the excitement around this pick, we’ve been asked by Sabres fans in the area to throw a draft party similar to what we do with the NFL so folks can get together and celebrate it. You’re damn right we will, so here we go…. From 5PM to 9PM, the Dahlin Special kicks in with $4 Labatt Blue drafts, $15 Blue pitchers, and 50 cent wings (orders of 10/20). Come on down to McFadden’s and watch us select the best defenseman seen in years, all are welcome! Oh…and RUSS BRANDON GOT FIRED, what a great offseason indeed!!!!! It’s finally here, in just hours we’ll find out if Buffalo has their quarterback of the future! If you’re on Twitter you can see the explosion of opinions about what Buffalo should do, who they should take. Me? For the first time over 15 years I have faith in the Buffalo Bills GM/HC duo that they’re going to do what’s best for the team to win. Not reach (JP Losman), not make a marketable pick (EJ Manuel), not make an arrogant pick (Roscoe Parrish) or an unneeded pick (Willis MaGahee). If they draft a QB, it’ll be one they view as the franchise guy. If they don’t, they didn’t feel comfortable with what was left or couldn’t pull off the trade needed. If they use picks 12/22 to enhance the team without a QB, I’ll take that as a win as they know they need a QB, but aren’t going to reach to do it. Whoever they pick, I’ll be behind 100%. 3) Oh, and our club was featured in the Buffalo News today too! Sounds like Ruben, Donald and Ted will be starting their podcast around 7pm, so we recommend getting there early as we’re sure it’s gonna be a heck of a crowd to see what McBeane does.